Relax on the glistening beaches of California or ‘shop ‘til you drop’ in New York. Climb the majestic Rocky Mountain ranges in Canada or enjoy the star-studded shows and casinos in Las Vegas. Whatever holiday you are looking for, you can be sure the very best of the USA & Canada will be found in our all-new 2018/19 USA & Canada brochure! Caesars Entertainment’s Las Vegas hotels have the world’s top accommodations, where guests can luxuriate in iconic surroundings as they fit in all the excitement of the strip. Whether looking to splurge on a luxurious suite, save with a budget-friendly room, experience a boutique hotel or find a pet-friendly resort, Caesars has it all. With a collection of centre-strip resorts, tailored service and stylish new rooms can be found at all properties. Offering exceptional accommodations, superior service, unforgettable entertainment, and world-class amenities like golfing, spas and shopping, Caesars Entertainment is the ultimate choice for a Las Vegas adventure. Get your holiday off to a flying start with an American Airlines and British Airways flight, offering a stylish arrival and a choice of cabins to suit all. With ergonomically designed seats, delicious meals, and full bar service in all classes, BA + AA can turn a long-haul flight into an experience worth savouring. See Las Vegas from a new angle with Maverick Helicopter tours, all of which depart from a private terminal adjacent to the iconic ‘Welcome to Las Vegas’ sign. From Grand Canyon adventures to thrilling night flights over the Strip, take flight in a Maverick Helicopter and enjoy an unforgettable Las Vegas experience. The world’s second largest country, Canada is the visit of a lifetime. Breathtaking natural scenery, unique wildlife, and vibrant, eclectic cities make it the perfect destination for a life-enriching trip. With 5 distinct regions that can all be visited within one trip or broken down and explored in detail for shorter stays, there’s something to entice everyone. Although its scale is quite something Canada can be comfortably explored by air with Air Canada, or by rail with Via Rail. A place where everyone longs to go – now is the time to visit Canada. Arrive in the stunning city of Halifax and collect your hire car to begin your exciting journey to experience the highlights of Nova Scotia. Enjoy a drive through the Lighthouse Route via the picturesque fishing village of Peggy’s Cove to Lunenburg, a UNESCO World Heritage Site. Spend time exploring the spectacular Kejimkujk National Park, before continuing onto Digby, which overlooks the broad Annapolis Basin and then continue along the Evangeline Trail to Pictou, a community rich in Scottish heritage. For a beautiful end to your journey, drive past rugged coasts, tranquil bays and beaches and unspoiled forests en route to Liscomb Mills, before dropping your car back in Halifax. Begin in Cosmopolitan Vancouver, a young and overwhelmingly friendly city with countless natural charms in close proximity. Shop till you drop on chic Robson Street, visit one of the city museums or cycle around the 1,000-acre Stanley Park. Drive on to Whistler, an alpine paradise famous for more than just skiing, summer visitors will be impressed by the area’s scenic hiking, biking and thrill-popping outdoor adventures. Finally take the short ferry hop across to Victoria, the capital of British Columbia and famed for its beautiful Victorian architecture and the beautiful Butchart Gardens. Embark on a captivating historic VIA rail journey following ‘The Ocean’ route starting in the bustling maritime city of Halifax, travelling through Quebec and Ontario along the path of the mighty St. Lawrence River into the bountiful Great Lakes region. Quebec City reveals a mix of modernity and traditional Quebecois culture that celebrates art, fine food and world-famous hospitality. A city tour of Montreal showcases the fascinating history of one of the country’s founding cities built on the shoulders of railway, steel and manufacturing giants of the colonial period. A concluding stay in Toronto adds a touch of dynamic urban flair, effortlessly mixing cultural influences from around the world. Enjoy a 2-night stay in vibrant Halifax, Nova Scotia before picking up your hire car and hitting the road to explore Atlantic Canada. Spend time exploring Fundy National Park in New Brunswick and perhaps witness the highest tides in the world at Bay of Fundy. Continue on and visit historic Charlottetown, Prince Edward Island and drive east along the Sunrise Trail to Pictou – known as the birthplace of New Scotland, then follow the Cabot Trail on Cape Breton Island – one of the world’s most scenic drives. With the Rocky Mountains stretched across them, Banff and Jasper National Parks are filled with dramatic, untamed wilderness. Explorers can hike to the tumbling Bow falls, take the gondola up to Sulphur Mountain and relax afterwards with an included visit to Miette Hot Springs. Be driven through an authentic Canadian wilderness as you venture off the beaten track towards Tweedsmuir Provincial Park, perfect for challenging backcountry adventures which are perfectly followed by an evening fireside. Take in the scenery on a memorable Inside Passage cruise to colourful and quirky Vancouver Island where Zodiac boat tours await, the perfect opportunity to spot Orcas and bears in their natural environment. Embark on an all encompassing wildlife tour in the beautifully wild and rugged province of Manitoba. Search for moose, black bears and bison in Riding Mountain National Park, made up of more than 3000 sq km of boreal forest, deep valleys, lofty hills and alpine lakes. Travel on for wild encounters and be mesmerised as you witness beluga whales feeding in the Churchill River. Enjoy the thrill of a full-day Tundra Buggy excursion in search of polar bears – Churchill is the Polar Bear Capital of the World. After dark there is a chance you may catch a glimpse of the ever elusive Northern Lights. The smartest way to visit Canada, Air Canada is among the 20 largest airlines in the world serving more than 200 airports. Fly direct from London Heathrow to Canada’s gateway cities. Or fly with Air Canada Rouge in summer from Manchester, Edinburgh or Glasgow. For those looking for a little more comfort, a dedicated Premium Economy cabin offers superior comfort with larger seats and extra leg room, premium meal service and enhanced amenities alongside priority airport services. 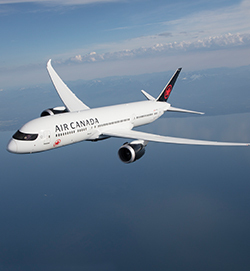 For the ultimate in luxury travel, choose Air Canada Signature Class with state-of-the-art amenities, sumptuous cuisine and an unparalleled service to make your trip unforgettable from the very beginning.